This may well be the most exclusive private home in Fiskebäckskil. It is located in the Östersidan (east side) area and was built in 1919. 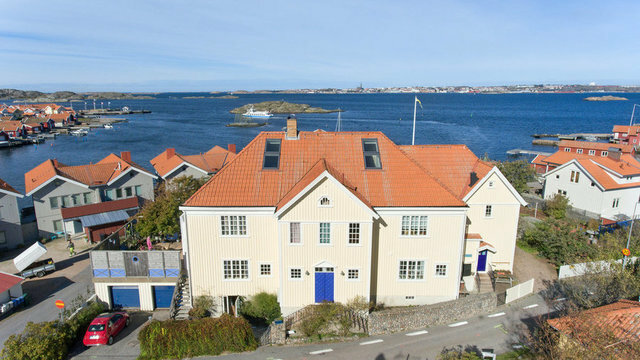 Constructed in Art Nouveau style, this home enjoys a marvellous sea view of the approach to the inlet or kil, as well as a large boat berth that is part of the property. Factory Owner Lycke’s two sons built the house with two identical floors. Recently, a loft level has been added to these. The 554 m2 area plus a two-car garage and basement are currently being used as a private residence, a rental unit and a store, but can easily be converted for other uses. The house has 12 rooms, six of which as bedrooms, an office, a library, two living rooms, a studio, four bathrooms, a two-car garage, many working tiled stoves, an outdoor spa and many patios, to mention several of the features that give this property added value. Geothermal heating ensures low operating costs. Ascending stone stairs, you first enter an inviting hall with direct access to the large, more public rooms. The floors have fine wooden flooring. Off the hall, there is also a cloakroom and a guest lavatory. Next comes an office or bedroom. The living room has a fireplace, oriel and a door out to the terrace with its sea view. The library is in a row with the living room. The stove, oven, refrigerator, freezer, microwave, dishwasher and larder are a few of the features of the kitchen. There is also room for a large dining table. The cosy veranda leads out to the terrace, which offers sunshine from the morning to the afternoon. This part of the house also has a bedroom with a tiled heating stove, a large bathroom with ceramic tiles, a whirlpool bathtub, shower and towel heater, as well as a laundry room area with a washing machine. In the other section of this level, there is a large room with a bathroom. This room is currently being used as a store. The second level has a similar layout, and is currently being rented to tenants who will be moving out on 1 December of this year. This level has four bedrooms, a living room, a dining room, kitchen, bathroom, guest lavatory, laundry area, tiled stove, fireplace and two balconies on this level. The upper level resembles an artist’s studio with an open layout, several skylights, a heating stove and a kitchen. From here, you can enjoy a spectacular sea view of the inlet. It almost feels like you’re sitting next to the water. There is a fully-tiled bathroom with ceramic floors and sub-floor heating, and from the bathtub, you can also look out over the sea. This level has a large storage space, too. The basement has many rooms, as well as a private entrance from the garden. A portion of the basement has a crawl space. There are several paved patios, an outdoor spa and a greenhouse on this elevated property with its magnificent sea view. The two-car garage and the paved driveway ensures parking for at least two cars. Welcome to this fantastic house with lots of room to socialize and entertain, as well as a boat berth with a three metre depth.